Acclaimed microphone manufacturer Lauten Audio has released a new tube condenser mic called the LA-320. Aimed at the entry-level user, the LA-320 is the first in a new range from the Californian firm called Series Black. It features a 1-inch pressure gradient true-condenser capsule, cardioid polar pattern, dual-triode vacuum tube, transformer balanced output, and independent high and low cut filters. 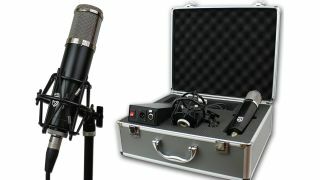 You'll also get a custom dedicated power supply, tube microphone cable, spider shock mount and hard case. Now that is a lot of microphone for what looks to be an affordable package. Already available in the United States, the LA-320 will be on sale worldwide later this year and has a street price of around $499 (SMRP $799). For more information on the LA-320 and Series Black, head over to the Lauten Audio website.